Small 4 Style: Trying Donna Karan's New Fragrance Thanks to W! Trying Donna Karan's New Fragrance Thanks to W! Donna Karan's WOMAN... isn't the bottle pretty? 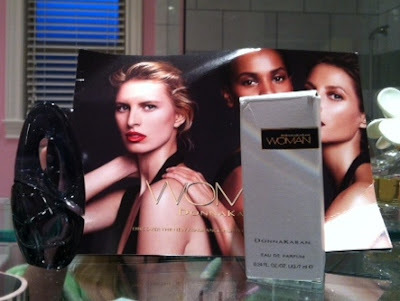 I was pleasantly surprised when I received a mini bottle of Donna Karan's new fragrance from W Magazine. The new scent is called WOMAN because it's strong and feminine. I love perfume but I don't like when it's overpowering. This scent is perfectly subtle. Donna Karan has created a nice balance with WOMAN. I love Donna Karan's new perfume, and it fits in well with my fragrance collection. Thanks W! Get your bottle here.